(Newport, RI)- Thirty-sevens J/70s sailed in the second annual New York YC One-Design Regatta. The fleet was comprised of numerous one-design class National, North American, and World Champions, most of whom are sailing the regatta as part of their training programs leading up to the WEST MARINE J/70 World Championship, hosted by Eastern YC in Marblehead, MA later in September 2018. A bad start in light air in a 37-boat fleet can be fatal. If you let it be. 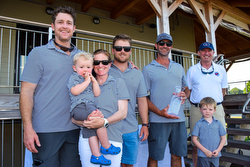 Skipper John Baxter and his team on the J/70 Team VINEYARD VINES were determined not to let a mistake at the outset of the first race define their regatta. So instead, they got to work, found the advantageous puffs and shifts, and battled through a fleet of top amateur and professional sailors to an 11th in the only race on the first day of the second annual New York Yacht Club One-Design Regatta, which was sailed Saturday and Sunday out of the New York Yacht Club Harbour Court in Newport, R.I. It wasn't anything to write home about, but it was enough to keep them in the hunt. On the finale on Sunday, in virtually identical conditions, Baxter and his team (wife Molly, Jake LaDow and Ben Lamb), were nearly unbeatable, winning two races and placing third in the final race to secure a seven-point win in the regatta's biggest class. "Yesterday we didn’t start very well; we were real deep and then we ground back to an OK finish," said John Baxter, from Riverside, N.Y. "Today, we started better and were able to use our speed to get out of some sticky situations. The goal was really to minimize the bad starts, because a lot of the teams go the same speed. You’ve got to have a front-row start and just go fast." Second was World Champion Tim Healy on USA 2 with a 1-9-3-10 tally for 23 pts. Third was Ryan McKillen’s SURGE (with Mark Mendelblatt as main/ tactician) with a 5-6-11-1 for 23 pts, losing the tiebreaker. Fourth was John Brim’s RIMETTE (with Taylor Canfield as main/ tactician) with a score of 3-2-4-20 fort 20 pts. Fifth was the top Japanese team- Eichiro Hamazaki’s THE SLED with a tally of 2-5-5-18 for 30 pts. For more New York YC One-Design Regatta sailing information Add to Flipboard Magazine.